February 19, 2013 (LocalOrg) - At a recent Washington climate change rally, who is demanding action? Demanding action from whom? What action? In reality, the diminutive, corporate-media inflated rally in DC was organized by the very corporate-financier special interests that have been wreaking terrible havoc on both the human population and the environment of this planet for decades. They are demanding action from a government that already represents their interests. Their demands are policies, particularly financial tax schemes that they themselves created and are are best positioned to benefit from while making no discernible impact on the very real environmental threats we collectively face. Image: Rampant CO2, high global temperatures, rising sea levels. A look into the future? 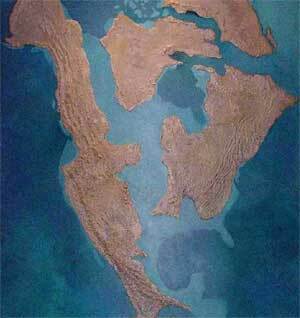 No, this is Mesozoic North America 250-65 million years ago. Climate change has happened long before humanity's emergence, it will happen again, with or without us. The key to preserving what we as humans value, including not only our cities, towns, and countrysides, but also ecosystems and species - is to devise technical, pragmatic solutions to ensure no matter what the climate does, we can not only survive, but thrive. It was an exercise in manufacturing consent for policies already long-ago devised and simply waiting for piecemeal implementation. Yahoo! News' report, "40,000 People Reported at Climate Change Rally," mentions 350.org as one of the rally's organizers and key representatives. Upon 350.org's "Friends & Allies" page, an extensive list of human rights and environmental racketeers can be found, all either linked, or directly connected to big-oil, big-finance, big-agri, and big-defense. The World Wildlife Fund (WWF) and its "Earth Hour" for instance, includes Fortune 500 corporations (page 24, .pdf) (and here) Walmart, Unilever, Coca-Cola, draconian intellectual property racketeer Christopher Dodd representing the Motion Picture Association of America (MPAA) as a director, Bank of America, Google, and others. While the WWF claims having big corporations as partners is "good news" for the environment, implying that they are shifting toward environmental responsibility - in reality it is exactly the other way around. Corporations are co-opting genuine concern for the environment to further enrich themselves and to create global frameworks that eliminate indigenous competition over resources they themselves are already exploiting and plan to continue exploiting. The lack of real, pragmatic solutions, or even an honest scientific discussion on issues like climate change are particularly telling. This collection of organizations falling under the 350.org website have also been key in pushing other establishment agendas, most notably regime change and political subversion worldwide, couching a corporate-fascist warmongering agenda behind liberal concerns for "freedom," "democracy," and "human rights." The climate of Earth has always changed throughout its natural history, and many times before the existence of man, has changed so dramatically that it has caused mass extinction events. 65 million years ago, for example, Antarctica was a thriving ecosystem covered in temperate forests inhabited by dinosaurs. The global temperatures were higher, sea levels were higher, and carbon dioxide (CO2) levels were many times higher than they are today. Higher temperatures, sea levels, and CO2 levels made the planet more habitable, not less. This changed however, and to the detriment of many species that are now extinct. Before the Cretaceous period, there have been many points throughout Earth's natural history, that were we as humans to travel back, would find uninhabitable. The atmosphere has been in a state of perpetual change, the biology driven by this change has likewise continuously evolved. There is no "norm" in terms of geology, biology, or climate. The only constant is the inevitability of its constant change. The climate will change with or without us. To ensure the survival of what we value in terms of human society, history, and infrastructure, as well as ecosystems and individual species we desire to preserve, we must come up with something better than "carbon neutrality" implemented by giving bankers yet another derivative to trade, and energy companies a legal framework to maintain monopolies over powering human civilization. Part of the solution is not only leveraging technology to protect our towns, cities, and countrysides from adverse weather, flooding, and changes in temperature through innovative infrastructure projects, but undermining, decentralizing, and eventually eliminating permanently these corporate monopolies that are demonstrably destroying the environment. Strange that 350.org wasn't marching against genetically modified organisms (GMO) and Monsanto's pursuit of overwriting the planet genetically. Could a planet face a more dire threat than being overwritten genetically, its very essence mutilated by profiteering corporations? Strange that 350.org's "Friends & Allies" don't demand an end to profiteering wars around the planet that see tons of depleted uranium, with a half-life of billions of years, being dumped in both human and natural habitats the world over. Strange that 350.org, and "Friends & Allies" like WWF have in fact partnered with Fortune 500 corporations that perpetuate global monopolies, centralized manufacturing and distribution (and profits) that encourage wasteful supply chains, unhealthy socioeconomic trends, incur large amounts of garbage, and require the very petroleum and CO2 producing processes they allegedly were in Washington to oppose. Indeed, 350.org and partners like the WWF do not represent corporations joining environmentalists, but rather represent environmentalists being co-opted and manipulated by the very special interests committing real harm to this planet. Waving around placards as part of a big-business rally couched behind environmentalism, demanding action from a government big-business already fully owns, simply legitimizes and manufacturers public consent for more of the same. More schemes, more waste, more fraud, more abuse, while the environment continues to unravel and a host of problems both directly and indirectly related continue to grow. Real solutions generally don't involve corporations or governments, in fact, as a necessity must exclude them. The marriage between corporate interests and government regulations should be something all of us can agree on, regardless of where we sit on the political or environmental spectrum. Real solutions involve a real education in science, technology, design, and manufacturing. This empowers people in all levels of society to accurately assess problems and apply local solutions. This, coupled with modern manufacturing technology enables more to be done on a local level, short-circuiting the petroleum intensive logistical chains WWF sponsors like Walmart couldn't live without. Organic farming on a local level coupled with local farmers' markets eliminates entirely the need for Monsanto poison, fertilizers, and genetically modified franken-crops, along with the replacement of the petroleum intensive logistical networks that distribute big-agri's products. 3D printing, computer-controlled manufacturing, and local hackerspaces that encourage local entrepreneurship accelerate technological development and solutions that allow us to live the lives we wish to lead while doing so more efficiently in terms of energy, waste, and environmental impact. In fact, when you think about it, almost all of these real solutions involve real community and local action, not placard-waving trips to Washington. These are not solutions that involve policies, taxes, and regulations, but rather technology, education, constructive, pragmatic, technical solutions that not only would make our environment more livable, but make our local economies and communities more viable and self-sufficient. The catch is, and the reason why this isn't being done, you will notice that none of these activities require WWF sponsors like Walmart, Nike, IBM, Toyota, Bank of America, Coca-Cola, HSBC, Citi, IKEA, Nokia, etc. We all desire cleaner air, healthier food, safer water, and greener parks. Waiting for a corporate-financier establishment to give it to us, when they themselves are the ones that have denied us of these essentials is the height of both naivety and futility. Does it make sense then, to see why real problems and their solutions have become the target of hijackers like the corporate conglomeration that is 350.org and the WWF? Does it make sense to see them offering "alternative" centralized, corporate dependent solutions that replace local activism and tangible, technological solutions? Why travel to Washington D.C. and demand non-solutions to real problems when you can organize locally and begin making this planet livable in very real, tangible, pragmatic, and measurable ways?